SurveilStar is a powerful and comprehensive employee monitoring solution designed to help businesses investigate employees, detect internal threats, and increase productivity. This platform has a spine of high-quality features which monitor and record the activities of every employee’s computer and the internet. It is an easy to use platform that helps you to remotely control your company’s computer network. The program gives all managers the opportunity to see a real time screen snapchat and stay in control of their employees’ computers. Besides, this software is also highly effective as a spouse monitoring platform. It’s also good for parents looking for a software to protect their children from the mischiefs of the internet. SurveilStar encounters no compatibility problems since it runs well on most of the renowned web browsers. SurveilStar puts you in control of the whole system via a stealth and active security mode. It ensures all the loopholes on the internet and in the system are tightly sealed. The email and instant message monitoring feature help the employers and parents alike to monitor the online conversations of their employees and children. It records all communications with their corresponding time stamps, content, and sender/recipient details. In addition, this program records incoming and outgoing IM messages from frequent messengers and gives you an option to block some of the conversations. Moreover, this software has the capability to record screen snapshots via its screen monitoring feature. It gives you the chance see what the employees/children are viewing in real time. The application monitoring functionality lets you control all the application being used by your employees. This helps in eliminating the problem of employees getting carried away by games or some specific sites. The website monitoring feature in another intriguing functionality. It puts you in control of all the internet browsing activities in your organization. It ensures you employees spend their online time on relevant activities instead of wasting time on internet fantasy websites. In addition, you get the privilege to filter unwanted sites in a bid to create a polished web environment. This ensures there is optimal security and productivity in your organization. 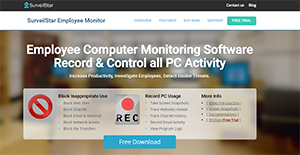 If you are considering SurveilStar it may also be a good idea to check out other subcategories of top employee monitoring software systems gathered in our database of B2B programs reviews. Since each company has specific business needs, it is advisable for them to refrain from seeking a one-size-fits-all ideal software system. Needless to say, it would be useless to try to find such a system even among widely used software solutions. The clever thing to do would be to catalog the various essential factors that require consideration such as required features, budget, skill levels of staff members, company size etc. Then, you should do your research thoroughly. Read some SurveilStar reviews and check out each of the other solutions in your shortlist in detail. Such comprehensive research can make certain you weed out ill-fitting systems and select the solution that presents all the elements you need for business success. How Much Does SurveilStar Cost? We realize that when you make a decision to buy Employee Monitoring Software it’s important not only to see how experts evaluate it in their reviews, but also to find out if the real people and companies that buy it are actually satisfied with the product. That’s why we’ve created our behavior-based Customer Satisfaction Algorithm™ that gathers customer reviews, comments and SurveilStar reviews across a wide range of social media sites. The data is then presented in an easy to digest form showing how many people had positive and negative experience with SurveilStar. With that information at hand you should be equipped to make an informed buying decision that you won’t regret. What are SurveilStar pricing details? What integrations are available for SurveilStar?